LSPR induced by their size and shape. preparation of metal nanoparticles in reverse micelles . 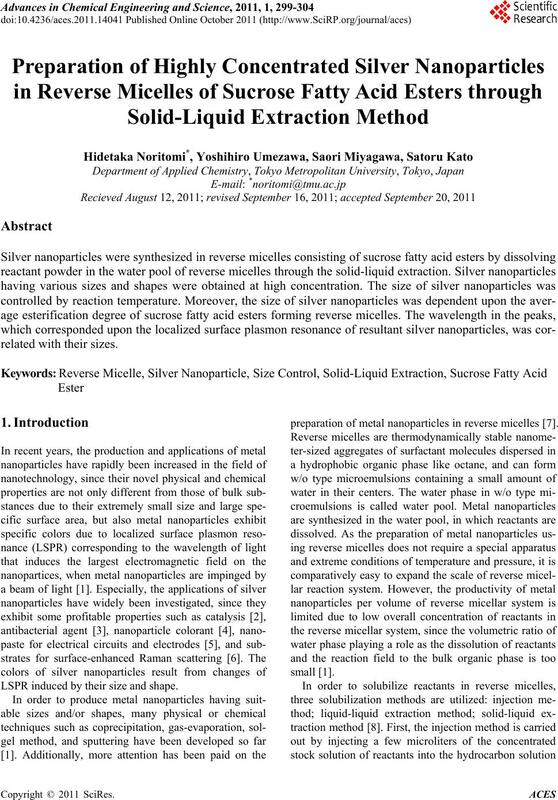 300 H. NORITOMI ET AL. micelles using the solid -liquid extraction method. ration of nanoparticles within a few minutes. borohydride powder into the reverse micellar solution. respectively, and the temperature was fixed at 25˚C. JEM-2000FX electron microscope operating at 200 kV. carbon-coated copper grids and drying it under vacuum. with a 10 mm quartz cell. pared by solid-liquid extraction method. tied reverse micelles approach solid reactants again. 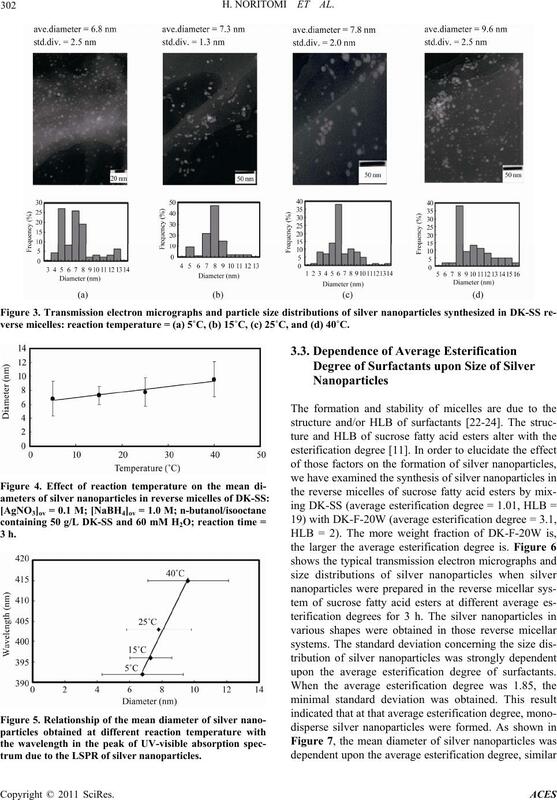 dispersion of resultant silver nanoparticles. to the case using the conventional injection method . 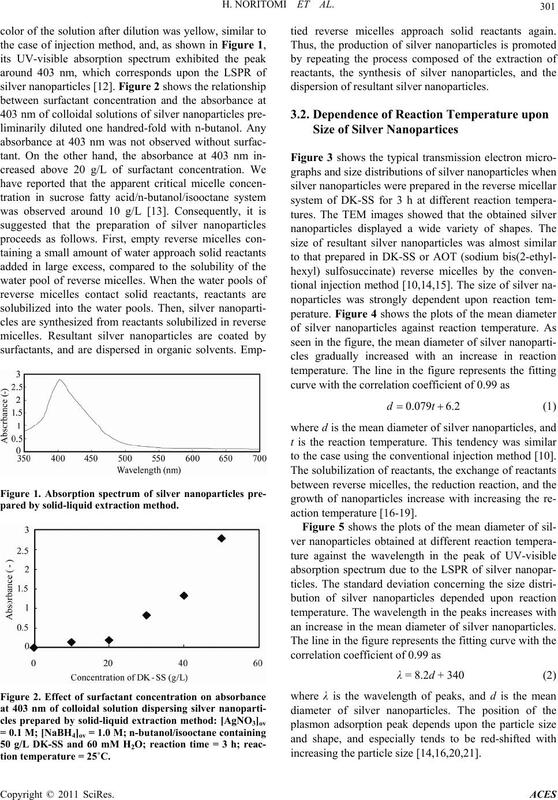 an increase in the mean diameter of silver nanoparticles. verse micelles: reaction temperature = (a) 5˚C, (b) 15˚C, (c) 25˚C, and (d) 40˚C. upon the average esterification degree of surfactants. 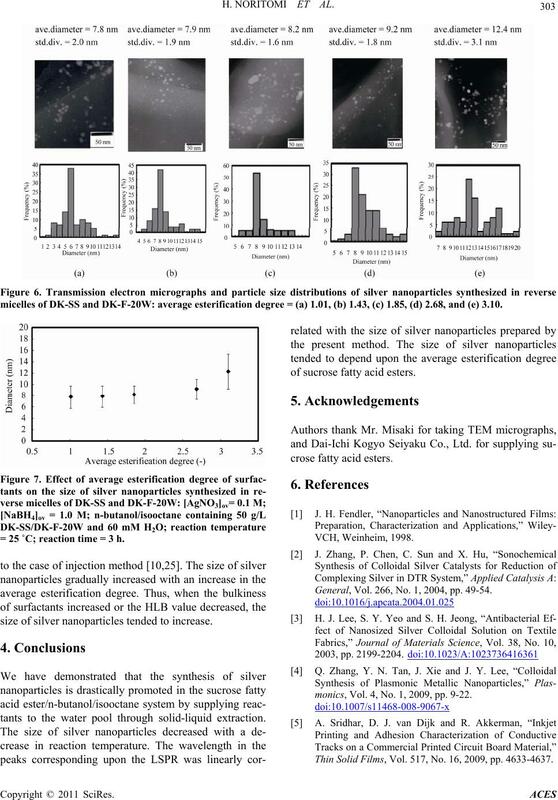 micelles of DK-SS and DK-F-20W: average esterification degree = (a) 1.01, (b) 1.43, (c) 1.85, (d) 2.68, and (e) 3.10. = 25 ˚C; reaction time = 3 h.
size of silver nanoparticles tended to increase. tants to the water pool through solid-liquid extraction. of sucrose fatty acid esters. General, Vol. 266, No. 1, 2004, pp. 49-54.
monics, Vol. 4, No. 1, 2009, pp. 9-22. Thin Solid Films, Vol. 517, No. 16, 2009, pp. 4633-4637. 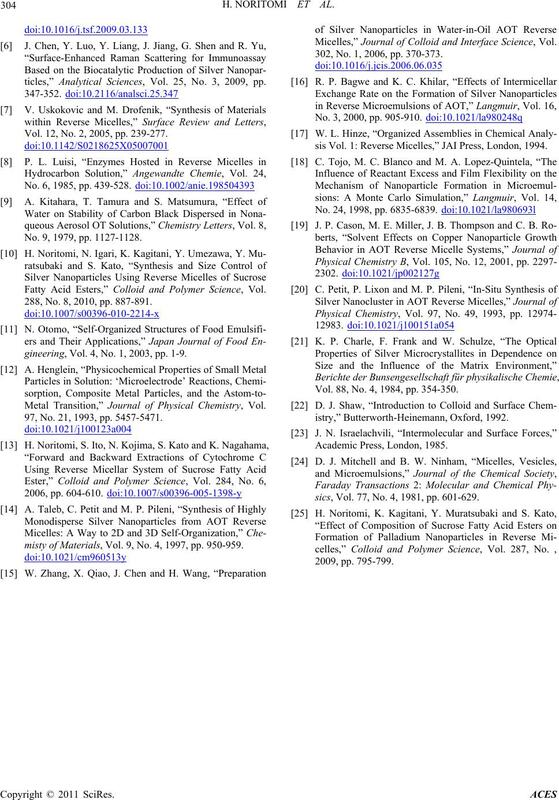 304 H. NORITOMI ET AL. ticles,” Analytical Sciences, Vol. 25, No. 3, 2009, pp. Vol. 12, No. 2, 2005, pp. 239-277. No. 9, 1979, pp. 1127-1128. Fatty Acid Esters,” Colloid and Polymer Science, Vol. 288, No. 8, 2010, pp. 887-891.
gineering, Vol. 4, No. 1, 2003, pp. 1-9. 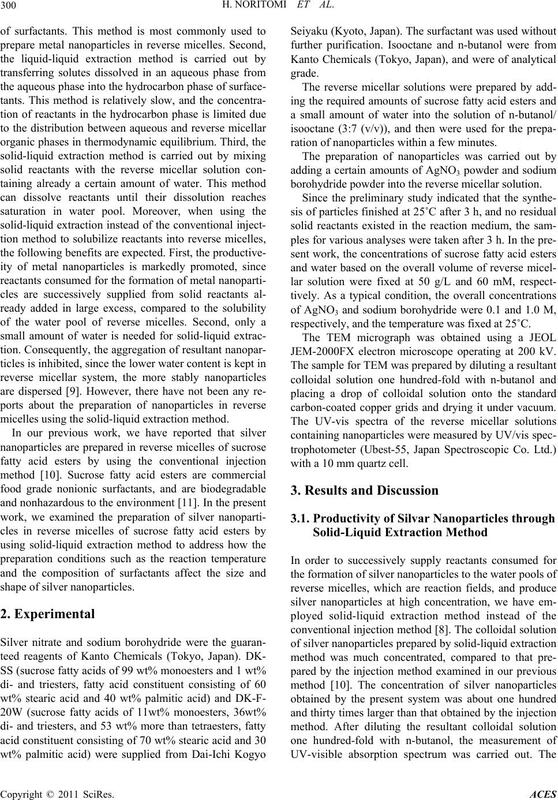 Metal Transition,” Journal of Physical Chemistry, Vol. 97, No. 21, 1993, pp. 5457-5471.
misty of Materials, Vol. 9, No. 4, 1997, pp. 950-959. Micelles,” Journal of Colloid and Interface Science, Vol. 302, No. 1, 2006, pp. 370-373.
sis Vol. 1: Reverse Micelles,” JAI Press, London, 1994. Vol. 88, No. 4, 1984, pp. 354-350.
sics, Vol. 77, No. 4, 1981, pp. 601-629.